The absolute greatest thing about Doctor Who as a show is its ability to shake up its own formula time and time again. Whilst this predominantly tends to happen at the alteration of a show runner, or the change up of the Doctor or the companion, this opening episode to the now ninth season demonstrates a massive shake up without any of the three big names changing. 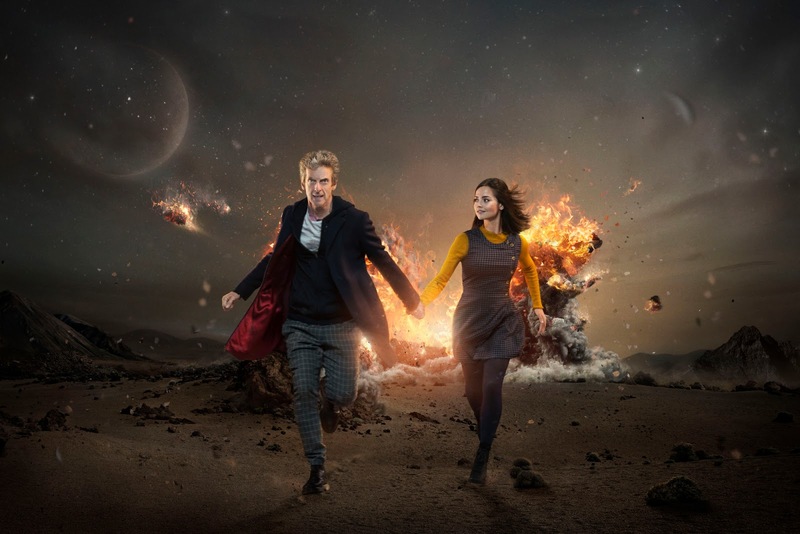 Peter Capaldi, Jenna Coleman and Steven Moffat all return for their second consecutive season as a trio, following on from the fan base dividing yet critically acclaimed season eight. I personally adore the show's eighth season. It has its misfires, mostly in the form of trees, but what would a Doctor Who season be without a few dodgy episodes chucked in? The Magician's Apprentice finds fantastic ways of shaking up a formula that worked effectively last year, and presents us with a whole new tone to explore for a whole new season. I feel this can be best summarised with the Doctor's entrance in this episode. Well, make that entrances. Peter Capaldi (as captivating as ever) was treated to two introductions in this episode, and they seem to be reflecting the two styles of the show he will have given us by the end of the year. The first time we see the Doctor in this episode he is shrouded in mist; hidden, obscured and wary. He doesn't get a clear close up until the shocking reveal that the child in front of him is Davros. This is a perfect summary of his character last year, the Doctor spent a lot of the season unsure of who he was, his vision was blurred and he was masked with mystery. Yet the Doctor's second introduction this season is bigger and bolder, it's a brash, loud entrance featuring tanks, electric guitars and the word "dude", which he has introduced a couple of centuries early. Judging not only by this episode, Moffat's own description of the season and the plot summaries benefit this claim too, this is a more effective way of foreshadowing this upcoming year. Doctor Who took a year off from aliens with season eight and focused on the people, what it meant to travel with the Doctor and, for the first time in real detail, the negative repercussions that can have aside from your parents getting a bit miffed. But that appears to be over now, as The Magician's Apprentice is the first part in an entire series of two part stories each seeming likely to get bigger and bigger, with more and more monsters. The episode isn't perfect, as per any Doctor Who two-parter there is the issue of about twenty minutes of plot spread to over forty, but Moffat does well to cover this up by littering the episode with an endless sequence of big moments and funny one liners. After having her character butchered in last season's mess of a finale, Michele Gomez is back as Missy again, and returns to top form. Her one-on-one scenes with Clara stand out especially due to their history, despite the fact they are shown to be on the same side, Clara is consistently visibly wary of Missy, and this helps to give even the quieter moments some edge that a lot of Doctor Who stories tend to lack. There's an impending sense of the episode blowing up any moment throughout, but luckily when that moment does come, it is not squandered. Missy and Clara walking through space was visually spectacular, and a surprisingly light-hearted, moment until the invisible planet became visible and revealed itself to be Skaro. What was a rather slow, but consistently enjoyable, episode went full throttle to the finish line, leaving us with a whopper of a cliffhanger leading into next week's resolution. If the scale and tone of The Magician's Apprentice is comparable to anything, then it's a season finale from Russell T Davies' era of the show. The type of big, loud, everything but the kitchen sink episodes that end on massive cliffhangers with everyone's lives at stake. It's a big risk to place an episode like this at the very front of a new season, but Doctor Who is a show that tends to pull off most of the risks it takes. If this episode is any indication of the series we're in for this year, it's going to be explosive. Yes, last year Doctor Who took a different route and put humans entirely before monsters, but for a show that's been running for eleven consecutive years since its revitalisation, I'm more than happy for it to dedicate one of those years to the people as opposed to the aliens. But that year is over now, and Doctor Who is back with big planets, big stories and big monsters. Bring it on. This was both written and directed by the respective writer and director of all-time classic Blink. It may not have quite reached that height, but the show never will again. Clara didn't have tonnes to do tonight, but her brief line to her school kids about Jane Austin being a phenomenal kisser was good. I'll miss her when she leaves at the end of this year. "I can't just phone the Doctor and bleat, he'll go Scottish". Another great Clara line. Missy playing her version of the Hey Mickey lyrics on that screen was great. She works best when she's fun and giddy without being too silly, and that balance was found tonight. In a rather dark story, contemplating the murder of a child, Missy was much needed. I'll end this review with a quote from the fourth Doctor that resonated, and was heard, in this episode. "If someone who knew the future pointed out a child to you and told you that that child would grow up totally evil, to be a ruthless dictator who would destroy millions of lives, could you then kill that child?"